How to Organize Your Refrigerator - Get Double the Space! If you find food working its way to the back of the refrigerator never to be seen again until you are greeted with an odor when you open the door... then it is time to get organized. Not only does this help you stay current with stale dated food, but it can save you money in the end so you don't have to keep purchasing food you don't need simply because you didn't know it was in the fridge. Below are some perfect examples of refrigerator organization, and for the sake of an hour on the weekend you can actually enjoy opening the refrigerator door and not be greeted with packed in food that spills out when you grab an apple or broken eggs because something heavy was place on top, or even better, the lovely science project growing in the back. Check out some of these ideas, and hopefully they inspire you to get cleaning and organizing in your refrigerator. Step 1 - Empty - You may need to do this in stages so your refrigerator doesn't get too upset with the door being opened all the time, or you can unplug it if you simply want to get serious right now. Have some plastic totes or a cooler ready and the green bin for throwing out spoiled food and science projects! Step 2 - Invest in a Few Fridge Containers - Look at the food you have left and decide the type of storage you need. 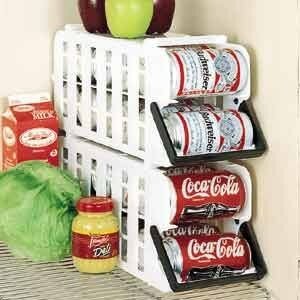 If you mostly store cans of pop or soda, you can get can storage or if you store bottles there are ways to stack these as to not take up the door space. Step 3 - Clean! - Give the refrigerator a good clean with a damp cloth and some vinegar or baking soda a water, to really freshen it up and then decide how you want to organize the space. Now you are ready to put it all back together. If the picture looks like any of the things you need to store, then this simple set of storage bins will work. The idea behind using bins instead of just placing items on the shelves, is that it keeps them in their own space without migrating or falling down the back never to be seen again. You can organize your entire refrigerator with these deep containers with handles. As you can see in the picture you just grab the handle and pull out the container to get your food. You can see what is in each container and these would fit nicely on the shelves. On grocery day you know at a glance what you are low on. 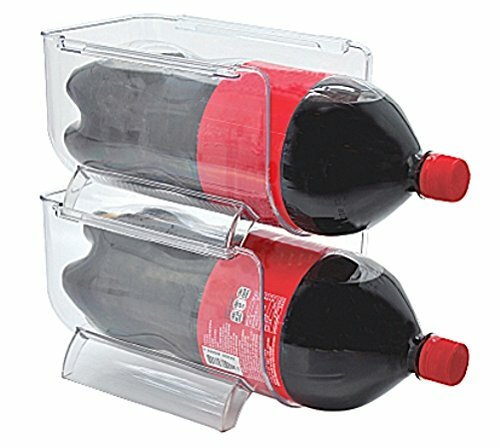 This holds the large 2 liter bottles of pop or soda, and as you can see it will instantly save room because it uses vertical room instead of side by side. This saves room in your fridge door too. 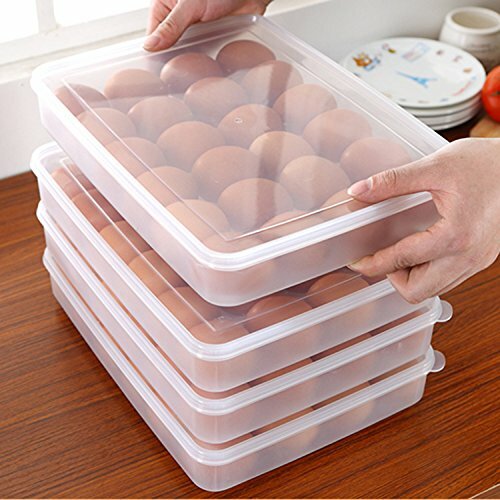 Each one of these containers will hold 2 dozen eggs, and because you have them in these special containers they can stack with no worries about breakage. They don't take up as much room in the refrigerator too. So if egg storage is your issue, investing in some containers and emptying them right into these containers on grocery day will keep them safe. If cans take up a lot of space in your refrigerator, then using the vertical space to organizer them makes sense. As you can see in the picture the beer and the soda can live together and take up very little space and easy to get at. Once you have all the refrigerator items in the right spots for you, this should leave the drawers free for your veggies or at least a container. 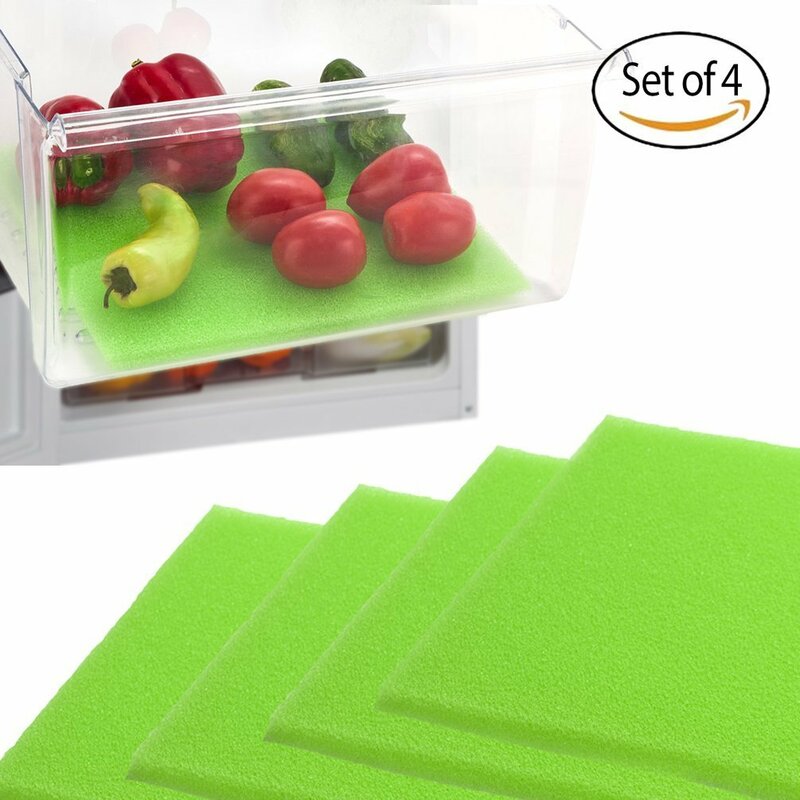 These special mats stop your fruits and veggies from rotting and extend their life. This will save on groceries. Get Rid of the Science Projects! Getting the fridge cleaned out may not be fun, but it is so rewarding when you see the food you worked so hard to provide neatly organized on the shelves. Keeping like with like helps to stop the migration of food to the back of the refrigerator too. Decide Which Type or Refrigerator Organization Works for You! We are all different in what we eat and stock in our fridge, so decide which items become a problem, is it eggs? or beer cans? or soda bottles? or is it all the bags of veggies? Get them out of the bags and into their own containers. When you first get home you just want to stuff everything in the refrigerator, but if you get them out of those grocery bags right away and into their own bins, you will stay organized and when it is time for a meal or a snack you won't have to go searching it will be all front and center! Use the vertical space for stacking and enjoy how good you will feel from simply organizing your refrigerator.